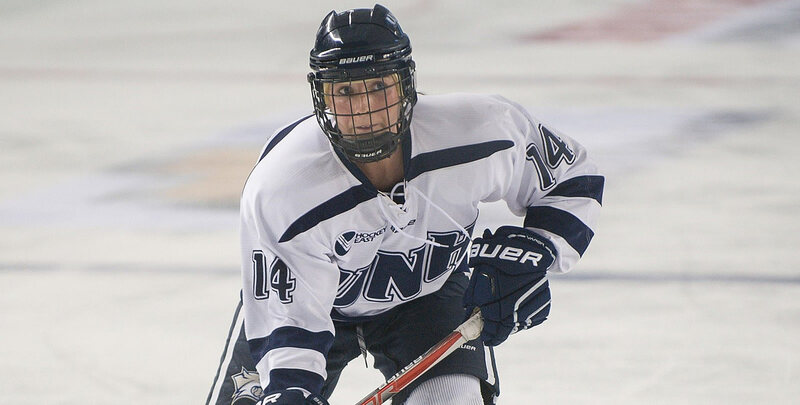 DURHAM, N.H. - The University of New Hampshire women's ice hockey team skated to a 4-1 victory over the College of the Holy Cross on Saturday, January 26 at the Whittemore Center Arena. The Wildcats tallied three third-period goals for the second straight game to get their second straight Hockey East victory. New Hampshire got three assists from senior defender Jenna Rheault (Deering, N.H.), including one on the game-winning goal by Grace Middleton (Midland, Mich.), the first game-winner of her career. In net, senior captain Kyra Smith (Littleton, Colo.) made 21 saves on 22 shots faced in the contest to put her record to 9-7-2 on the year. The Wildcats and the Crusaders will face off again on Sunday afternoon, January 27 at 1:05 P.M. on NESN. The Wildcats return home next Saturday, February 2 at 2 P.M. to start a two-game home series with Maine. For tickets, visit UNHWildcats.com or call (603) 862-4000. Both teams came together pre-game for a puck drop ceremony featuring UNH grad Jamie Lynch from the class of 1999, who is now cancer free after being diagnosed during her pregnancy in 2013. She was joined by her husband Mike, and her sons Connor and Carson. Every player on the ice wrote on a card who they fought for in the battle against cancer. - After a scoreless first period, UNH's Jenna Rheault took an initial shot from just inside the left circle that was saved. With the puck rebounding right in front of the crease, Taylor Wenczkowski (Rochester, N.H.) took her opportunity to bury the puck past the goaltender to put the Wildcats on top, 1-0, at 11:39 of the second period. - Adding to their lead, Rheault passed the puck towards the slot to Grace Middleton, who took a one-time shot from right inbetween the faceoff dots that found its way to the back of the net at 2:27 of the third period to make it a 2-0 game. - The Wildcats upped their lead to 3-0, at 7:11 of the third. Rheault took a shot that was saved, but rebounded right in front. With another chance, Lauren Martin (Cambridge, Ontario) pushed the puck through traffic in the crease and into the net. - Holy Cross cut into the deficit when Rachel Moore passed the puck up to Maeve Reilly, who then sent the puck towards the front of the net. Controlling the pass, Katie MacCuaig, tapped the puck across the line to the right of Kyra Smith, making it 3-1 at 13:40 of the third. - A little over two minutes later, the Wildcats secured the 4-1 win over Holy Cross at 15:47 of the third. Carlee Turner (Scottsdale, Ariz.) lifted the puck into the top right corner of the net from a pass sent up by Devan Taylor (North Billerica, Mass.). - Jenna Rheault's three assists were a career and season high in both points in a game and assists in a game. The last time a Wildcat tallied three assists in a game was December 3, 2017 in a 5-3 loss to Northeastern. The three assists belonged to Carlee Toews. - Holy Cross went 0-2 on the power play. The Wildcats have now only allowed eight power play goals on 83 opponent attempts, for a .904 kill percentage. - Wenczkowski, Taylor, Rynne, and Pelletier are now all on a two-game point streak. - The Wildcats tallied 45 shots on net in the contest; they tallied a season-high 58 at Holy Cross in the first two meetings of the teams.